1989 was quite the year, with the iconic Tiananmen Square protests, Michael Thomas sticking it to Liverpool in injury time to win the league for Arsenal and the launch of both the GameBoy and Mega Drive. It was also the year West Midlands rockers 'The Wonder Stuff' released their greatest album, 'Hup' to adoring UK audiences. Now the band have decided to mark the 21st Anniversary of its release by re-booting the album and performing it all over the UK during April. The current line up have re-recorded the album and some bonus tracks that were released with singles from that era and are set to perform it in it's entirety when they hit the road from the 16th October, starting in Oxford's 02 Academy followed by shows in London (17th), Bristol(18th), Newcastle (22nd), Leeds (23rd) and finally Bournemouth on April 25th. 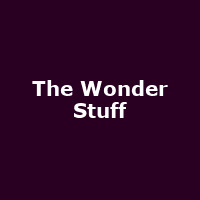 With that and a triple CD/DVD of their homecoming show in Birmingham to be released on February 22nd it seems like 2010 will be a wonder year for The Wonder Stuff. Tickets for all gigs are £20 (not including booking fees) and are on sale now so click the links beside your preferred destination below and get ready to rock, revamped 80's style! Support for the Hup Tour comes from London singer/ songwriter John McKeown (formerly lead singer with Hero) and Liverpool's Amsterdam.